BILLINGS, Mont. 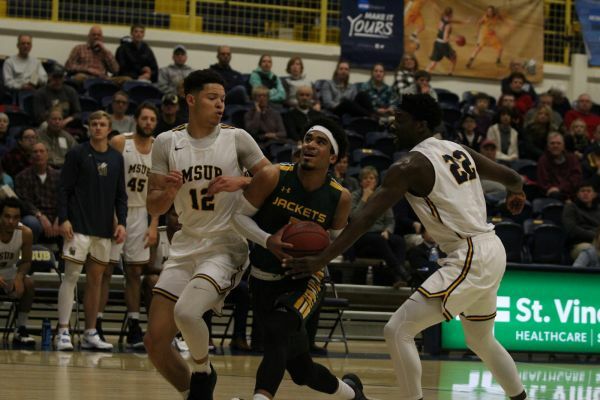 – Despite holding a six-point halftime lead, the Black Hills State University men's basketball team fell to Montana State University Billings, 90-70, on Saturday evening. Makaleb McInnis led the way for the Yellow Jackets (1-3) with 18 points, while Dez Stoudamire had 15, and Fraser Malcolm added 12 points. The Yellowjackets (3-3) jumped out to a 7-0 lead before a three-pointer by Stoudamire got BHSU on the board. The Green and Gold used a 7-0 run of their own to take a 13-10 lead with 13:47 remaining. The rest of the first half continued the theme, with each team using runs to take a small lead, but neither team was able to take control of the game. The score was tied three times in the first 20 minutes, with the lead traded back and forth three times as well. With just under six minutes left in the period, the score was tied, 28-28. A pair of free throws by Patrick Mendes, and a trey by Stefan Desnica put the visitors up by five. After Zack Rollins made a jumper for MSUB, back-to-back three-pointers by Malcolm and Stoudamire, followed by a pair of shots at the free throw line, gave the Yellow Jackets their largest lead of the game at 11, 41-30. MSU Billings scored the final five points of the half, and BHSU entered halftime leading by six, 41-35. With 18:28 left to play in the game, MSUB went on an 11-0 run to retake the lead, 49-45. With 11 minutes to play, the Yellowjackets began to take control of the game, eventually leading by 15 with just under five minutes remaining. Despite Connor O'Hearn scoring eight points in the final three minutes, the home team would secure the 90-70 nonconference victory. BHSU shot 36.5 percent from the field (23-for-63), while MSUB was 54.5 percent from the floor (30-for-55). The Yellow Jackets were 14-for-34 (41.2 percent) from beyond the arc, while the Yellowjackets were 11-for-23 (47.8 percent) on three-pointers. The Green and Gold were outrebounded by MSU Billings, 41-34. Melvin Newbern Jr. had a double-double for MSU Billings, recording 22 points and 11 rebounds. Tyler Green had 19 points. The Green and Gold will next open Rocky Mountain Athletic Conference play, traveling to South Dakota School of Mines on December 1. The rivalry game is set to tip off at 7:30 p.m. in Rapid City.